Mixer.com – an alternative to Twitch.tv and a streaming platform gaining nothing but popularity is becoming more and more widespread, with more streamers than ever and now more viewers too. Mixer (previously Beam) was purchased by Microsoft back in 2016 and has since been integrated straight into Xbox One, making it an extremely accessible streaming service for casual console gamers looking for an audience. Mixer also has a host of unique features on the platform that aren’t yet available anywhere else, like MixPlay – which lets viewers interact with streamers in unique and interesting ways within certain games. So with the influx of Mixer streamers and users, we have decided to add Mixer support to our most popular Twitch WordPress plugin – Twitch Wall Pro. Mixer Wall Pro allows you to easily embed a group of Mixer streams on your WordPress website. Embed streams based on a game, a list of mixer channels, or a Mixer team. Advanced shortcodes allow you to embed multiple Mixer Walls on your site, quickly and easily. Check out our Mixer Wall demo here. YouTube streamers may be glad to know, that in combination with our work on the mixer.com API integration last week, our WordPress themes for streamers now fully support YouTube Live! Broadcast Companion (YouTube) unlocks the exact same functionality for our WordPress themes as our Twitch equivalent – Broadcast Companion – which we’ll now be re-naming to Broadcast Companion (Twitch). When combined with Broadcast or Broadcast PRO, Broadcast Companion (YouTube) hooks into the YouTube Live API and pulls the following information from your YouTube stream. You’re also able to directly embed your stream within your website when you’re live. Now that our flagship WordPress themes support the top 3 streaming platforms out-the-box, you can expect some major improvements and new products on the way soon. For a limited time, both Broadcast Companion (Mixer) and Broadcast Companion (YouTube) are 33% off! Mixer Support for Broadcast and Broadcast PRO! Mixer.com, Microsoft’s answer to twitch.tv has been slowly growing over the past couple of years (and was previously known as beam). As the platform grows, more and more Mixer users have been requesting that we integrate our WordPress products – namely Broadcast and Broadcast PRO – with the Mixer API. Well today we were finaly able to make that happen with the release of our first Mixer WordPress plugin – Broadcast Companion (Mixer). Broadcast Companion (Mixer) unlocks the exact same functionality for our WordPress themes as our Twitch equivalent – Broadcast Companion – which we’ll now be re-naming to Broadcast Companion (Twitch). When combined with Broadcast or Broadcast PRO, Broadcast Companion (Mixer) hooks into the Mixer API and pulls the following information from your Mixer stream. So that’s it! Mixer support is just the beginning for us, and you can expect us to start integrating other streaming platforms like YouTube Live and Hitbox into our themes next. Our ever-popular plugins – like Twitch Wall PRO may get support for these platforms eventually – but for now our focus is going to be on our WordPress themes for streamers – Broadcast and Broadcast PRO! It’s been a very busy year for us here at StreamWeasels, with the release of our latest and greatest WordPress theme for Twitch streamers – Broadcast PRO – and the release of three new WordPress plugins for Twitch streamers, Twitch Rail PRO, Twitch Wall PRO and Twitch Player PRO! The good news is that you guys seem to love the new plugins and they have quickly become our best selling products. We have had a constant stream of good feedback, feature requests and bug reports, which has spurred on the development of the plugins to the point where they just keep getting better and better – and we’re not done yet! I have some big plans for new WordPress themes and plugins for Twitch streamers down the line – but for now what I’m introducing today is the StreamWeasels affiliate scheme! If you run a Twitch stream, a YouTube channel, a community website or something else and you have a following which may have some interest in buying WordPress Themes & Plugins for Twitch streamers – you can now earn cash by referring users to our site. It’s quite simple really – you can set up an affiliate account here, and within a couple of minutes you can be earning 25% referral fees on each and every purchase you send our way. The link generator in the affiliate dashboard will give you a unique referral URL to any of our pages or products, which you can then add to your Twitch panels, YouTube video description, website banners, discord bots – the possibilities are endless and the more users you refer, the more cash you will make! You can cash out whenever you want through the dashboard – payments will be made instantly via PayPal with no hassle, no fuss – it’s that simple. So if you’re interested, head over to our Affiliate Area now and register your affiliate account. If you have any questions, you can leave a comment below, or get in touch directly through our contact form or hit me up on twitter! Since releasing Broadcast PRO 2.0 earlier this year – our flagship WordPress Theme for Twitch Streamers – we’ve also been hard at work releasing WordPress plugins for Twitch Streamers – for those users who are looking for a way to embed twitch streams in their WordPress site. We released our very successful Twitch Wall PRO and Twitch Rail PRO a few months ago, and now we have just released our third WordPress plugin for twitch streamers – Twitch Player PRO. Twitch Player PRO works in a very similar manner to Twitch Wall and Twitch Rail, with a couple of key differences. The layout and style of Twitch Player is obviously very different, with one large featured stream on the left and a list of streamers alongside it on the right. We hope that this specific layout will be more desirable to users who are looking to feature a lot of streams, but don’t want them to take up a ton of space on the page like Twitch Wall does. As with all our plugins, there is of course a free version of Twitch Player PRO which you can get directly through the WordPress plugins page – there are more details on that here – Free Twitch Player for WordPress. As a first for us – the free version of Twitch Player does allow you to show both online and offline streams in your WordPress site (something we usually only make available in our PRO plugins). However, the total amount of streams you can show with our free plugin is limited to 5. If you have any feedback on the plugin – we’d love to hear it. Feel free to leave a comment here, tweet us, or get in touch directly! Broadcast PRO, Twitch Rail PRO and Twitch Wall PRO! 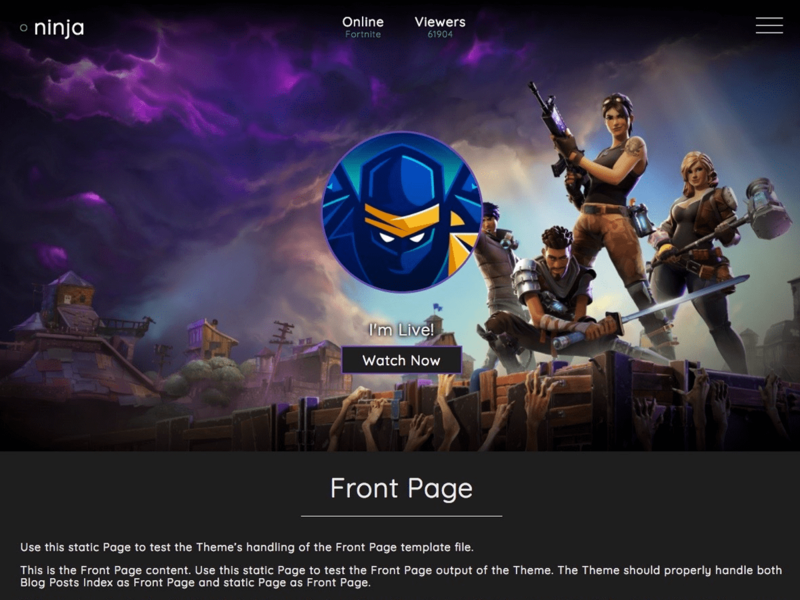 Back in April I announced my plans to make some major upgrades to our premium WordPress Theme for Twitch Streamers – Broadcast. Well it’s been a busy year and those plans finally came to life last month when I released the long-awaited 2.0 update to Broadcast PRO, completely rebuilding it from the ground up. With a fresh new design and a ton of new features, lots of you have already made the 2.0 upgrade – and we’re selling more themes than ever before! Alongside Broadcast PRO, we also now have a new theme Broadcast Lite, which is available for FREE from the WordPress.org Theme Library. Now with over 200 installs, just search for Broadcast within your WordPress theme pages and you’ll find it! This month we have also excitingly released our first PRO plugins for Twitch Streamers – Twitch Rail PRO and Twitch Wall PRO. Both of these plugins are optimized to pull data directly from Twitch’s new Helix API and display streams to your users through the use of a shortcode – compatible with any WordPress theme! The easiest way to embed streams in WordPress! You can buy Twitch Rail PRO now for $10, or see our demo page for more examples. You can buy Twitch Wall PRO now for $10, or see our demo page for more examples. It’s certainly been a while since I’ve posted anything up on here, and I’ve had a few emails enquiring if I have any plans regarding Broadcast updates and the likes so I thought I would share them here. This year, Broadcast, Broadcast PRO and a new theme, Broadcast Lite will all be receiving major upgrades. In fact, I’ve rewritten their entire codebase, to bring them up to a greater standard using the latest and greatest in web technologies. Broadcast lite will be our latest and greatest FREE WordPress theme for twitch.tv streamers. This theme will be available to publically download through the WordPress.org theme library, meaning you can one-click install Broadcast Lite directly through your Wordpress admin interface (yay!). New, fresh, sleek design based off of the original Broadcast design that you all love so much. Better mobile & tablet support for the ever-increasing mobile market. Automatic updates through the WordPress.org theme library! Broadcast Lite users will not be able to change the colour scheme without making manual CSS changes yourself. We understand this is quite a large drawback for our free users, however, the plan here is to spend much more time improving the colour scheme system which should theoretically allow the system to handle infinite colour schemes, meaning you can style Broadcast exactly how you want it, to match your stream theme, branding and identity. This new colour scheme feature will be rolled into Broadcast PRO. New, fresh, sleak design based off of the original Broadcast design that you all love so much. Past Broadcast and Vods support. More stuff currently in the works! The initial plan was to release Broadcast PRO 2.0 early in the year, as most of the work on the above features has already been completed, but since then plans have changed, and I started to rebuild the entire thing from scratch to bring it more up-to-date. Because of this, I’m aiming for a summer release on Broadcast PRO 2.0. Current Broadcast users will get an automatic update in their WordPress admin interface, and as the new admin screen will be making use of the core WordPress Customizer, you will have to reload all of your imagery and data into the new Customizer screen, which should only take a couple of minutes! So keep an eye out in your admin interface, and please reach out if you have any questions on the future of the theme or if you have any suggestions! Our current free theme, Broadcast, will be discontinued very soon and completely replaced with Broadcast Lite. This will likely happen within the next couple of weeks once Broadcast Lite has been approved for use on the WordPress.org theme library. Current users of the Broadcast theme will be unaffected and can continue to use the theme, however, they won’t receive any more updates or support and I would fully encourage everyone to upgrade to Broadcast Lite once it’s available! Thanks, more updates coming soon. First of all a big thanks to everyone who has either tried Broadcast for free or purchased Broadcast PRO over the last couple of months. Seeing the steady stream of downloads and seeing the cool things you guys are doing with the theme gives us motivation to continue to improve! The big new feature in Broadcast 1.1.0 is embedded streams! Now you can choose the desired action of your ‘Watch Now’ buttons whenever you’re online. You can either continue to point users to your twitch page, or you can now embed your stream directly in your site. You’ll find this new option under ‘Theme Options‘ -> ‘Stream Settings‘. As well as the above new feature, we also fixed a couple of bugs that appeared due to a recent update to both Chrome and Firefox. If you find that your current version of Broadcast has a bugged navigation in either of these browsers, upgrading to the latest version will fix this. Remember, Broadcast PRO users get free, instant updates through the WordPress interface as long as they have provided a valid license key. Regular Broadcast users will have to upgrade manually, details on how to do that can be found on our support page here. We are very excited to announce the we have officially released our first WordPress Theme ‘Broadcast‘ and ‘Broadcast PRO‘. If you’re looking for a WordPress theme to accompany your Twitch.tv streaming career, Broadcast integrates flawlessly with Twitch’s API to pull all sorts of information about your live stream. All it needs to get going is your twitch username, it’s really that simple. You can find out more about the requirements to get up and running on our support page here, or alternatively you can get in touch with more specific questions directly via our contact form here. You can also find us on Twitter where we’ll be happy to answer questions, provide support and keep in touch!